An article in today’s (Sept. 25/14) Globe and Mail focuses on the role of the House of Commons speaker when it comes to keeping MPs on topic when they rise to speak. It’s the same a Toastmaster meetings and especially so during the business session. It is not the role of the chair to force members to do anything (and at First Oakville Toastmasters that is pretty much an impossibility as our members well understand their rights and responsibilities as members and woe to a chair who attempts to dictate an outcome) but rather to ensure that fairness and decorum prevail. If a member or an executive for that matter rises to speak and one or more members are left unsatisfied, they too can attempt to be recognized by the chair and speak their own minds. The role of the chair is to start the business session on time, conduct the orderly flow of business as dictated by his or her agenda, ensure fairness and then end the business session on time or at the very least at the time demanded by the members (one ore more who may challenge the decision of the chair to conclude the session or may rise to move a motion to suspend the rules which is always and dangerous (when it comes to timing) but exciting part of any business session. At the very least it indicates some members are definitely involved in what is happening in their club. Business sessions are all about how we behave and interact as a group. Some people never learned how to play fair in the sandbox at school and this shows up in later life in business, home and even Toastmasters. Working with others in group situations is never easy but a well-meaning and well-trained chairperson can sure make the process easier, even pleasant. A chairperson who dictates can find themselves at the centre of a verbal firestorm. Seems Speaker Scheer understands his role in the House of Commons better than most. It is a new season of toastmasters and we have the first three weeks under our belt. It is so good to see so many of you back and so glad that you could find us. We have had strong attendance the first three weeks and averaging three guests per night, which is really encouraging. Like nature and business one must be flexible and able to adapt to the changing environment or you will not survive. As toastmasters we learn to handle change and difficult situations. Weather it is a cell phone going off during a speech, a piano playing in the lobby or the noise of a wedding reception next door we learn and are able to adapt. To survive as a club we must also learn to change and adapt. First Oakville Toastmasters is entering a new phase, like many times before in its 57 year history it is adapting and changing to survive as a club. As an executive we had an unforeseen surprise this summer as our previous venue made several changes to our rental agreement, which represented a 54% increase in rental fees. Due to shrinking membership numbers the executive would have had to raise the membership fees to unreasonable number over $350. This would have been unacceptable and was felt would have caused the collapse of the club. We began the process of adapting and started to look for a new venue. Many were investigated and two were identified. The Knights of Columbus was the most economical and suitable for our club. It was determined to be the best venue for the long term health and success of the club. As many of you have noticed our club is no longer a 45+ member club. Many of our friends are not returning. Some have moved, some have work and family obligations and some are trying new activities to help their personnel growth. We will miss them and wish them well in their new adventures. But what does this mean for the members of First Oakville? Again we must learn and adapt. It means that we all will be more involved each week with rolls and this is a good thing. A much more reasonable size club will allow for more speaking opportunities and more advanced roles. We should be able to grow and develop our members with quality in a reasonable time frame, which keeps their interest. I have heard from people outside our club that First Oakville just happens. It just doesn’t happen. The success of First Oakville is not due to the executive, but the hard work of all its members. 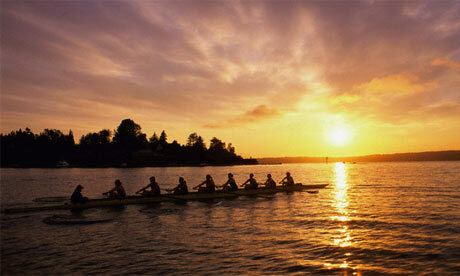 The executive is like the cox in a rowing shell, we guide and encourage, but we can’t row the boat alone. It takes all of you to row the boat and make First Oakville successful. If we all share the work we will go farther than if only a few of us row. When only a few row, they become fatigued and burnt out. There are many different ways you can help row our boat; regular attendance, fulfilling your roles and finding replacements when you can’t, participating in contests as functionaries or contestants. One can be part of the Video, Christmas Party and Charter Party committees, 50/50 ticket seller. There are positons on the executive. And for senor members being a mentor. I call all First Oakville Toastmasters to become engaged and row strong.